When my sister and I were very young, we would get up in the morning and walk with our mom over to our grandparents’ home on Ponce de Leon Street. We’d gather up our beach supplies in various bags, and then we’d all walk down their street, cross highway 98, and find the little trail that led us right onto the wide open beach. There was the Gulf. Ebbing and flowing, waves crashing, birds flying over it, scouting for their breakfast, pools of fish occasionally breaking the surface. Even at my young age I knew it was something unusually big. Not only big in size, but big within creation itself. My little sister and I would swim and climb on floats and build castles of sand, with moats all around. We’d follow along behind Grammy and mom as we searched for shells along the shoreline to incorporate into arts and crafts projects. I can still remember digging my chubby little hand down into the wet sand as a wave receded, and pulling up a handful of coquinas, trying desperately to burrow themselves down into the sand. 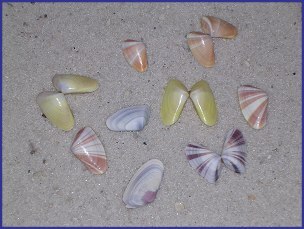 The empty coquina shells looked like little, shiny butterflies. We loved finding those! When I was nine years old, I was baptized in the waters of the Gulf of Mexico. Our little Baptist church didn’t have its own baptismal pool, so we all trekked down the two blocks from the church on Columbus Street to the water’s edge, and I and an adult couple were baptized by Preacher Smith while the congregation sang hymns and prayed for us. Everyone said it was beautiful. I was mainly hoping not to drown right there in front of God and everybody. In our adolescent years, my sister and I would go to the beach together or with our respective friends. We’d spend long, hot afternoons lying on blankets on the sand, sipping Diet Coke and eating Doritos, while Steve Perry and Journey belted out amazing tunes, like “Don’t Stop Believin’,” on our boom boxes. Our skin was slathered with Hawaiian Tropic suntan oil, spf 8, if we had it, because it smelled so amazing. (I still stop at suntan lotion displays in grocery stores and open the bottles, my nose searching for the perfect scent of summer. ) If we didn’t have it, we’d use good old-fashioned baby oil, and when the sun finally cooked us just a little bit too much, we’d run down the sand and jump into the waves to cool off, laughing and talking about boys, parents, and what we thought we’d be when we were older. As a young college student, I worked at a seafood restaurant on Mexico Beach called The Fish House. It was hard work, but I liked the other waitstaff and learned how to serve pretty well. 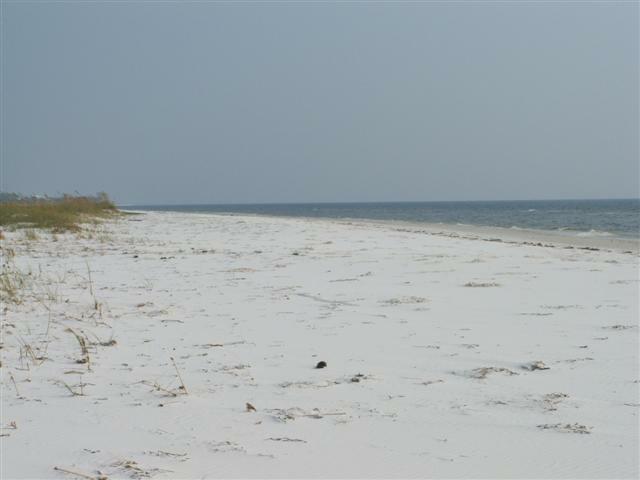 After bustling days of serving crab fingers and fried shrimp to tourists, I’d often head down to “my beach,” which is what I called the beach at the end of Columbus Street on St. Joe Beach, to take a nice long walk. I had big hopes and dreams about my future, and spent a lot of time praying and wondering what was going to happen when I moved away from Gulf County. It seemed to me then, and still does today, that I can hear God better when there by the Gulf, waves churning out their beautiful music while the sun sets on the western horizon. I can still close my eyes and smell the salty breeze and feel the spray on my face. Heavenly. I moved to Pensacola to attend the University of West Florida in 1988. 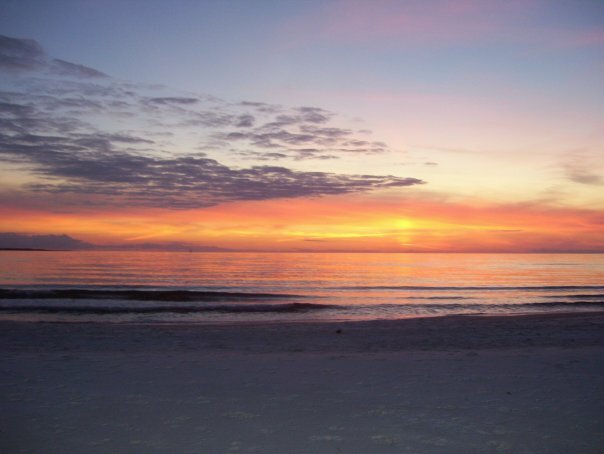 Wonderful things happened in my life in Pensacola: I got my bachelor’s degree, made lifelong friends, met my future husband, got my first teaching job, and had three sons. Pensacola is a wonderful city, and nearby Pensacola Beach is lovely, as well, though it is more “tourist-y” than my beach at home in St. Joe. I love to walk on the beach in Pensacola with my little sister now; she still lives there, while my family and I are now in East Texas. When I visit her we walk and talk and speculate and reflect and laugh and cry. It’s wonderful. However, I don’t really feel God, almost like I’m standing face-to-face with Him, on that stretch of sand; not the way I do on my beach in St. Joe. There is something special about that place. Now there has been an oil spill. You know the details, so I won’t recite them to you here. I won’t even get political and accusatory. I’m just very sad that my beach is going to soon have black, greasy globs of tar washing up onto that pristine, powdery sand. I’m sad that the sea gulls and pelicans are going to have to go far away from St. Joe Beach to find live fish to eat, if they can survive long enough to fly away. I’m sad that the fishermen and shrimpers whose families have lived there for generations will soon be told they can’t drop their nets anymore to find the treasure that feeds the tourists and feeds their own families. I’m sad that the coquinas will likely suffocate under the slicks of oil on the beach. I’m just sad. However, I do know that, though it may take many years, St. Joe Beach will eventually be clean and come alive again. I know that people will eventually bring their children back to the shores of the Gulf to play. Someday the fishermen will slide their boats along the waters, under the Highland View bridge and out into the Gulf to find healthy fish once more. Perhaps I’ll even be there with my grandchildren one day, and I’ll teach them about the coquinas and why they burrow in the sand, and I’ll tell them about walking this very beach with Grammy and mama long ago, searching for shells, before there were so many people and houses along the highway. 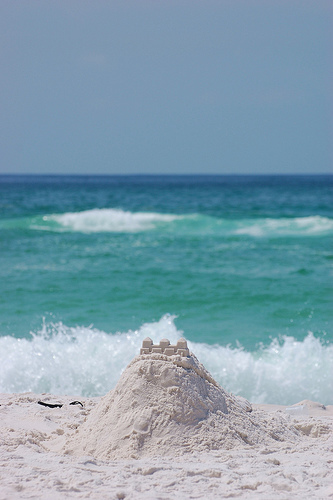 They’ll laugh and run and build castles of sand with moats all around. I’m going to look up on that day, and smile at God. He’ll still be there, too. AND…I didn’t know you worked at the Fish House! It’s still all the rage, of course. Can’t wait to get back and get my toes in the sand. Sans tar balls! I did work there, Chelle! 🙂 It was a great summer job. It has been remodeled and has new owners now, but it’s still going strong. I am going to Pensacola next Monday for a week; oil is only seven miles from shore there. It will likely beat me there. Sad. When are you guys going next? I am saddened that the oil spill is getting closer to Pensacola Beach. A soft spot for me too as where I attended school as well. I have lived in Neptune Beach for the last 12 years and could not bear to think if that was happening here. Yours words were so beautiful and evoked such fond memories of me growing up and spending time at the beach with my family and friends. Most importantly it is where I take early morning walks and spend time with God in mediatation and prayer so I get that. I too can feel his presence even stronger when I’m sitting on that beach. Thanks for reminding me to count my blessings and to remember those who are being effected by the oil spill in prayer today. Beautiful, historic memories shared there, my precious friend. Thanks, Angela. It brought tears to my eyes when I was writing it, the way memories often do! Love it, perfect. You are a writer. Marlene, thanks so much for taking the time to read and remember with me. I looked up to you and Karen and Laura so much; y’all are certainly a part of my memories, too, as well as your mama and daddy! Such wonderful people! Stephanie, What a perfect description of St. Joe Beach. I love it too. There is a peace sitting on that sand, looking at that sunset that you can’t get anywhere else! Thanks for the link to your blog. It’s really great. Thank you, Donna! You’re right about that peace; it’s amazing and unlike anywhere else I’ve been! I enjoyed your article, Sherrin. I loved your attention to the details that made me relive my own youth on your (my) beach. Very nice!! You made me hear the surf, feel the sun, dig for coquinas before they could escape, and feel again that all is right with the world. Thank you for sharing! Thank you for reading, Mrs. Harrison! 🙂 You certainly had a hand in teaching me to write at our beloved Port St. Joe High School! I hope you’re doing well and enjoying your summer. Very nicely written, Stephanie. It truly brought out a nostalgic moment in me as well as a little ‘eye water’ for the memories and this current sadness. Thank you, Ron. It brought tears to my eyes as I was finishing it yesterday, too. Sweet memories, leading to such a sense of impending loss. Great article. Thanks for sharing your memories!! This tragedy is so sad and I feel for everybody that it’s directly touching. Sad for all of us, in fact. Thank you for reading, Susan; I agree with you completely. Sad for us all! Already enjoy your diverse blog. I’m a Tylerite who writes for KLTV in your community among other places, such as HubPages.